I don’t believe “hub” is a technical term you will associate with PubSub or Observer pattern, but I believe “hub” helps to describe these patterns better. 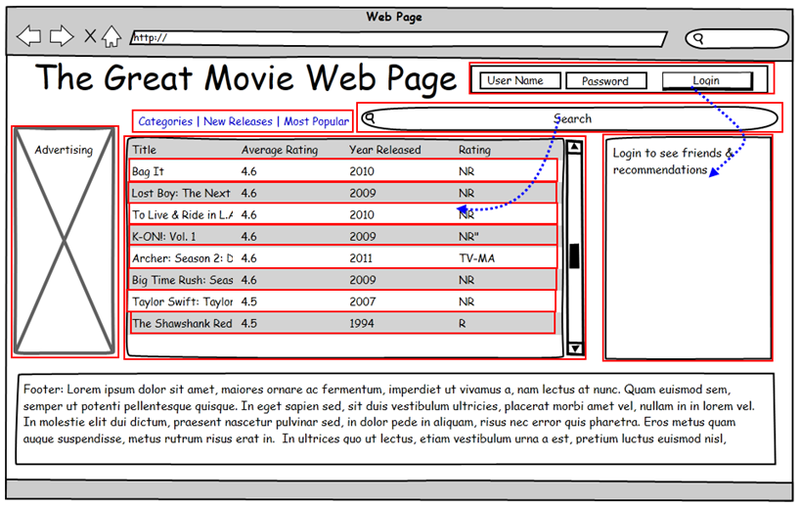 In the following example we are going to create a controlPanel object. We are going to create a customerServie object. The customerService object is going to subscribe “Door:Open” event. 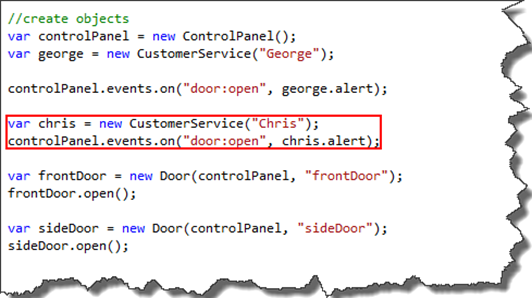 When the “Door:Open” event is triggered, then call the “alert” method on the customerService object. 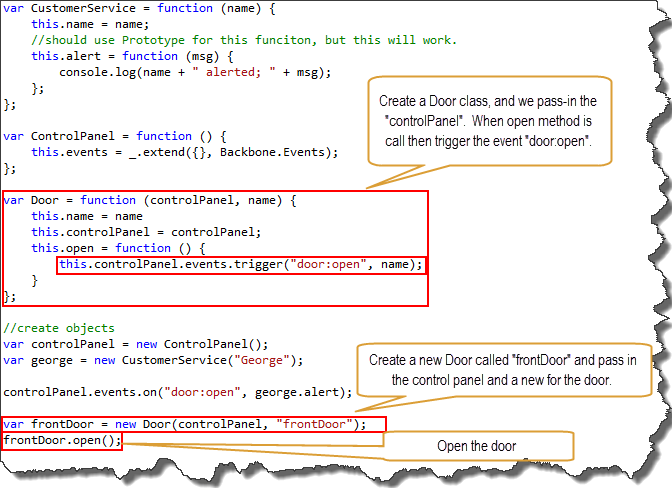 In this example the door is not going to trigger the event; we will trigger the event manually. We just want to make sure everything is working before we move to the next step. //should use Prototype for this funciton, but this will work. To start out, we have a “ControlPanel” class that has a one property called events. 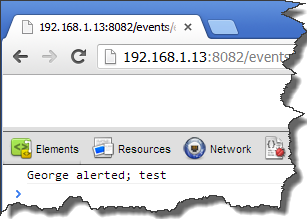 We are using underscore (_) to copy Backbone.Events functionality to the “events” property of the control panel. 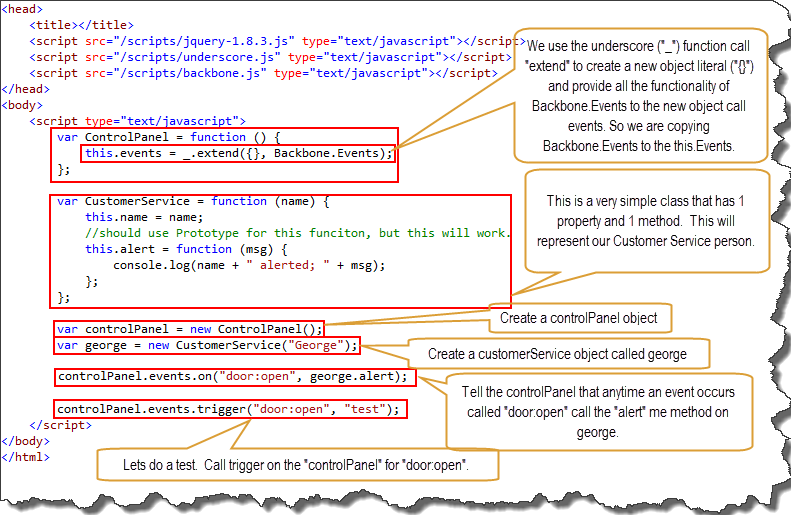 If you don’t understand this, see Backbone.js documentation on events at http://backbonejs.org/#Events. Next we create a “CustomerService” class. This is extremely simple. This class has a property and method. There’s nothing special here. Next we create a “controlPanel” object from the “ControlPanel” class. 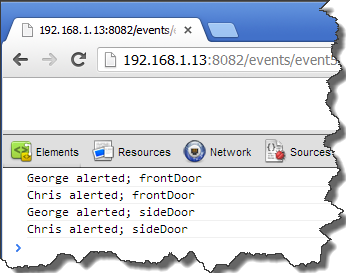 Now, we tell the “controlPanel” “events” that anytime you see the event “door:open” call “george.alert”. The “on” method is used to subscribe to an event. 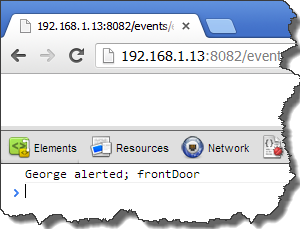 So, “george.alert” is subscribing to the “door:open” event. 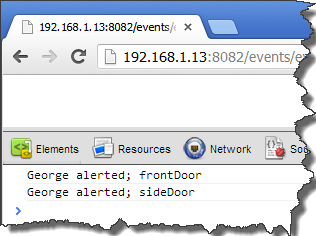 To validate this works, we manually call “trigger” on “events”, and pass in “door:open”. We also pass “test” as an argument that will be passed to the method “george.alert”. The key here is the string “door:open”. 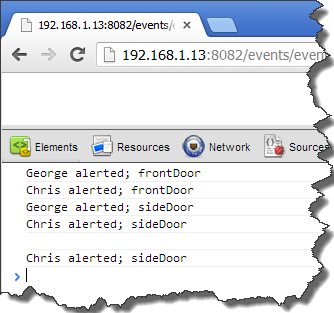 The “events” uses “door:open” to identify if there are any subscribers that needs to be notify. If it finds a subscriber, then call the method(s) associated with the event. Here’s something interesting. 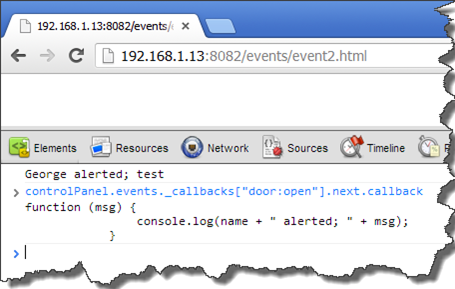 In the browser console I type in “controlPanel.events._callbacks[“door:open”].next.callback“. I’m not going to discuss this, but I believe it’s something good to chew on. It’s time for the Door to trigger the event. The primary thing I want you to get out of this example is that the Front Door is not aware of the George, and George is not aware of the front door, but the front door can trigger George events. 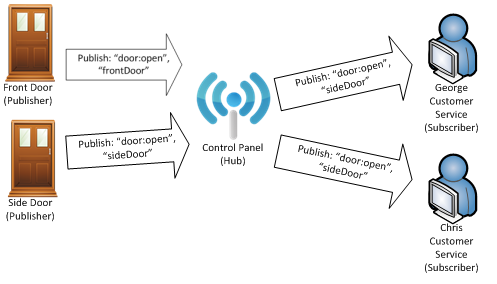 This example is not much different than the previous example, other than the frontDoor(publisher) is triggering the event. The hub is forwarding the event to “george” the subscriber by calling “george.alert”. Now what happens if we have two Doors (publishers) triggering “door:open” events? All we did was add an additional Door called “sideDoor”(publisher) and called its open method. Now the “george”(subscriber) is notified of the “frontDoor” and the “sideDoor” opening. Still the doors(publisher) has no knowledge of the “george” (subscriber). And it was very easy to add an additional publisher. Now what happens if we have multiple subscribers listening to “door:open” events. In this example, all we did was add a new “CustomerService” object called “chris”(subscriber). And we told the “controlPanel”, anytime the “door:open” event occurs, call “chris.alert”. Now what happens when we unsubscribe “george” “open:door” from the “controlPanel”? Here we tell the events that if you are aware of an event called “door:open” and it assigned to “george.alert”, please unsubscribe. We can see in the results that when we called “sideDoor.Open” that “george.alert” did not get called, but “chris.alert” did get called. I believe this enough for this session. Hopefully you understand Pub-Subs and the quotes above will make a little more sense. This was extremely helpful. I almost skipped over it but I’m glad I didn’t. I think the “one-to-many dependency” analogy is really the key to the whole article; coming from weeks of ORM work, that is. This is a really interesting implementation of PubSub in Backbone and a really terrific, detailed article. Have you come across anyone else implementing it this way where the “events” object is a property of the application namespace? i dont understand why you are using the control panel instead of writing “this.events = _.extend…” directly into the door class. Could you explain this?